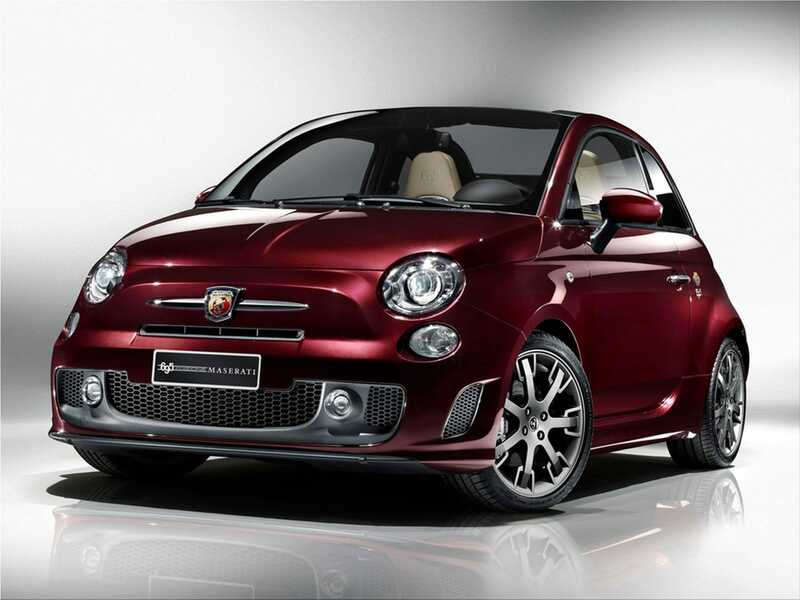 Fiat launches Fiat 695 Abarth Maserati Edition limited series that develops 180 horsepower from a turbocharged 1.4-liter petrol. 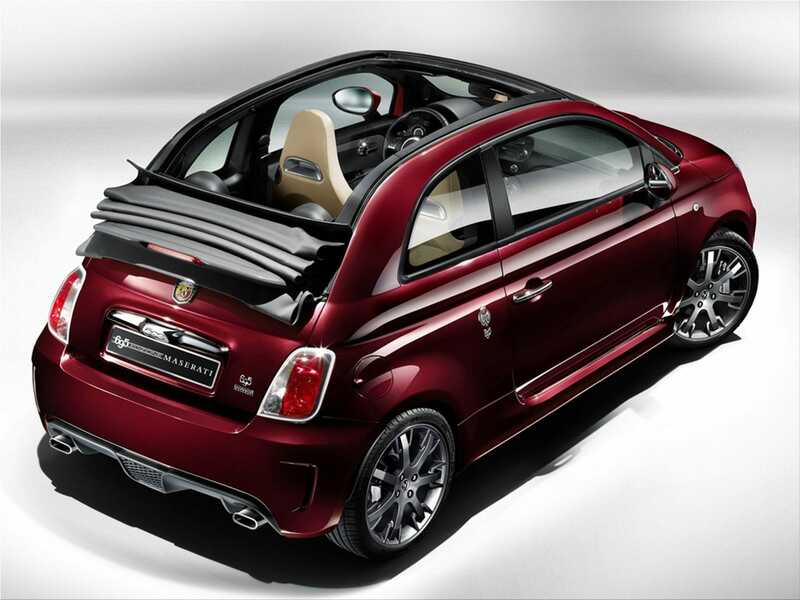 695 Abarth Maserat is derived from Fiat 500C, the convertible version of the small Italian city model. The manufacturer says Fiat 695 Abarth Maserati comes with Abarth Competizione automatic gearbox with control paddles on the steering wheel. The car has a maximum speed of 225 km / h and can reach 100 km / h in 6.95 seconds. In order to effectively restrain the 180 hp on a car so small and light, the car is equipped with ventilated Brembo brakes with 305 mm discs. The car is dressed in a special color, Pontevecchio Bordeaux, and has as standard Xenon headlights and JBL audio system. 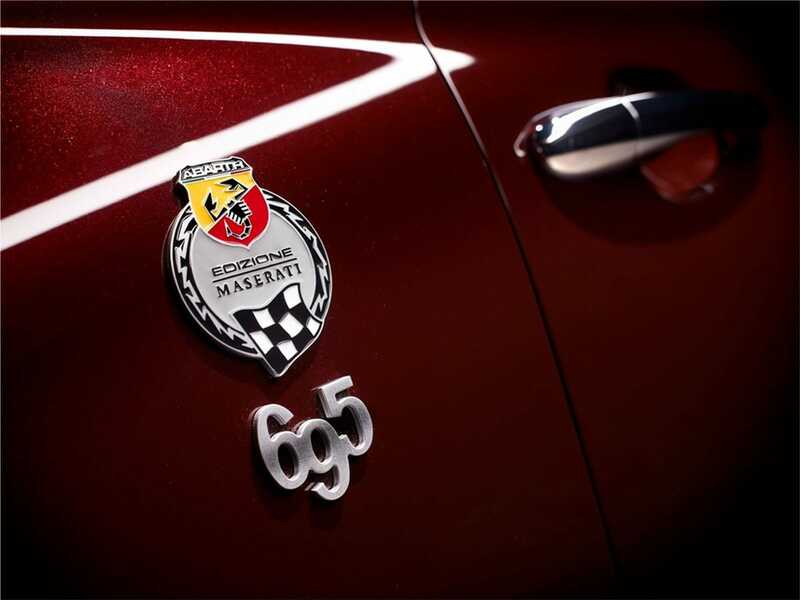 The Abarth 695 Maserati Edition, the new Limited Edition (499 vehicles) will make its society debut on the occasion of the thirtieth anniversary of the Mille Miglia, which Enzo Ferrari called "the most beautiful race in the world". Displayed at Piazza della Loggia in Brescia in the midst of the collectors' automotive jewels and "luxury cars" of today, this glamorous car represents the bond between Abarth and Maserati, based on a host of shared values, including attention to detail, elegance and a passion for performance and sport. Following the collaborative project three years ago with Ferrari and the creation of the Abarth 695 Tributo Ferrari, this is one more project that confirms the authoritative presence of Abarth in the luxury sports segment, this time flanked by a brand whose history of sporting achievements and elegant road cars is recognised worldwide. Karl Abarth and Alfieri Maserati: two legends, united by passion for mechanics and engines, who lent their names to two of the most prestigious companies to manufacture cars marked out by style and unmistakable performance. 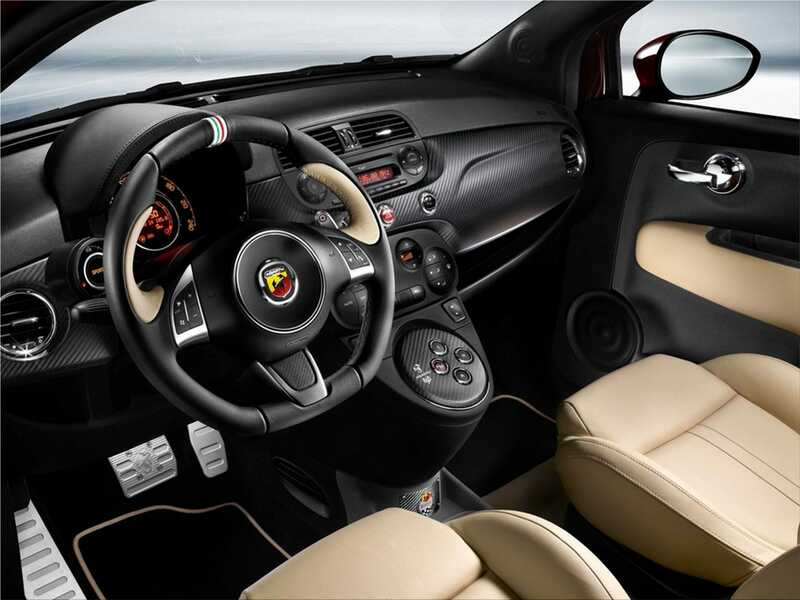 Just as the Abarth 695 Tributo Ferrari is the utmost expression of Abarth's sporty character and "racing spirit", this new Limited Edition epitomises sheer elegance united to the comfort of a "GranTurismo", but with the handling of a car fit to take to the road every day. The new Abarth 695 Maserati Edition is an exclusive convertible which blends the aggression and sportiness of a high-performance car with the refined, elegant aesthetics of a convertible. In keeping with Maserati's standards, this new Limited Edition is distinguished by excellent handling and outstanding sportiness, together with a great level of comfort and attention to materials and detail. The new Abarth 695 Maserati Edition features exclusive style details and special technical features developed by Abarth engineers for Maserati. To start with, the 1.4 Turbo T-Jet 16v engine boosted to 180 HP and teamed with the electrically operated manual Abarth Competizione gearbox with steering wheel controls, which enhances the performance of the engine with reduced gearshift times as well as guaranteeing an experience of superior comfort at the wheel. Again to improve performance, especially acceleration, the car is fitted with performance tyres on 17" alloy wheels featuring a special Maserati-inspired "Neptune" design. The ride and braking system have also been strengthened to cope with the extra power: Brembo 305 mm brake discs that can be dismantled with grey fixed four-piston caliper, and special Koni shock absorbers that guarantee performance in complete safety. Nor would it be complete without the variable back-pressure "dual mode" exhaust, designed to improve engine performance and deliver an inspiring sound above 3,000 rpm, with tailpipes which have been modified to assume the hexagonal shape which has always marked out Maserati cars. The car's exterior features a body in Pontevecchio Bordeaux. This colour from Maserati is achieved with special three-layer paintwork which reflects light and accentuates the shine of the colour. The same paintwork is also to be found on the door mirrors. The electrically controlled soft top is made of grey fabric. The customisation is just as complete on the inside. 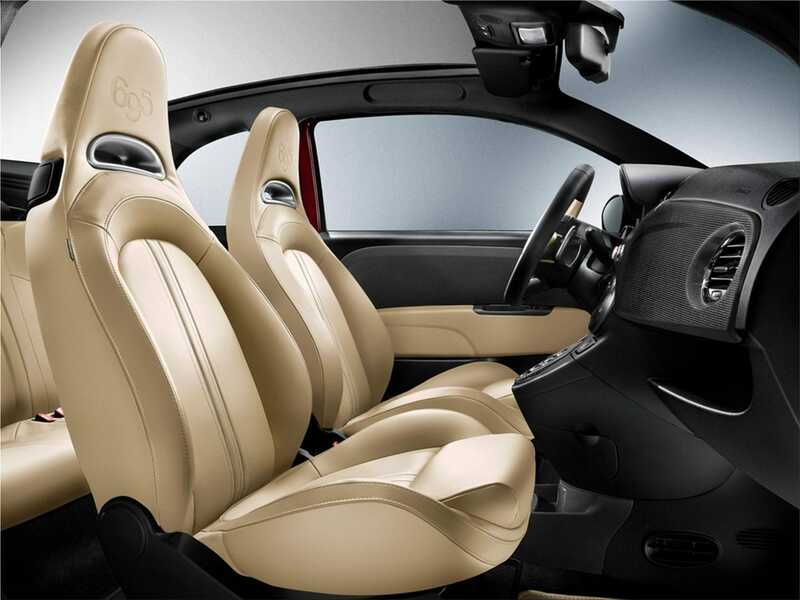 The interiors demonstrate both the attention to detail and the sportiness that characterise the two brands, starting with seats upholstered entirely in sand beige leather, with containment strips featuring single-layer padding, sporty but elegant and comfortable at the same time, and stylish details such as the number "695" heat-printed on the headrest. The dashboard and gearbox trim are distinguished by a special matt-finish carbon lining, further enhanced with the 695 logo, while the door panels and rear panels undergo a special UV-LUX treatment, which lends the trims an elegant grey "flocking" effect. The black leather steering wheel is characterised by beige leather inserts and tricolour hub and houses the "steering wheel gearbox" controls, while the instrument panel has been specifically produced by the Jaeger brand. 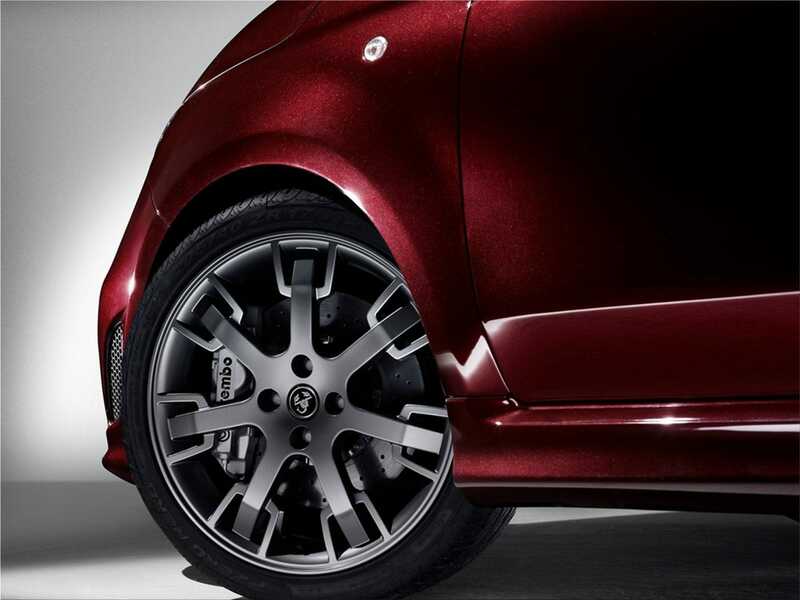 Other details enrich the interior, such as the aluminium pedal unit and sill plate, the carbon fibre kick plate with customised "Abarth 695 Maserati Edition" graphics and the plate with the car's series number from 1 to 499. Lastly, as proof of its touring vocation and to enhance the on-board experience, the Abarth 695 Maserati Edition comes as standard with a boosted JBL hi-fi audio system with 9 speakers and an 8-channel amplifier supplying 400 W of total power. In accordance with the tradition of Abarth Limited Editions, the already extensive equipment of the Abarth 695 Maserati Edition is expanded through accessories and merchandising designed to enhance the experience of the brand both on board and outside the car, as dictated by the DNA of Abarth and Maserati - more than just a car, a genuine philosophy of life. To take just one example, the Tramontano Tribute to Abarth Travel Pack, comprising two stylish anthracite leather travel bags. Electric power steering with "sport mode"